[S2872] David J. Van Middendorp, family tree titled "Family of David J. 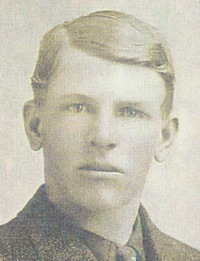 Van Middendorp", published by Ancestry.com, wc.rootsweb.ancestry.com, from database named airwings, updated Jul 2009, viewed Nov 2012. Buried at Forrest Lawn in Omaha, Neb. Worked as a painter and for the railroad most of his life. Railroad people called him King Tut, because he taught everyone how to play dice and gamble. He was a good man, served as a Shriner for many years. In his early years he sold insurance on a Harley Davidson and a Indian Motorcycle. The funeral for Edwin A. Tuttle, 85, Omaha, Neb., who died there Saturday will be Tuesday at 1 p.m. at the Roeders Funeral Home in Omaha. Mr. Tuttle, a Leavenworth native, was a member of Hiram Lodge No. 68, AF--AM, York Rite bodies and Shrine of Omaha, Della Chapter 60 and Eagles Aerie No. 38. He was employed by the Missouri Pacific Railroad until his retirement. 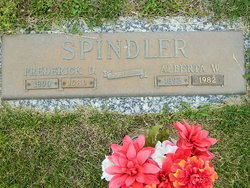 He is survived by four daughters, a son, a sister, Alberta Spindler, 765 Olive; a brother, Russell A. Tuttle, 920 S. 5th; 34 grandchildren and 36 great grandchildren. Masonic services will be a the graveside in Omaha. 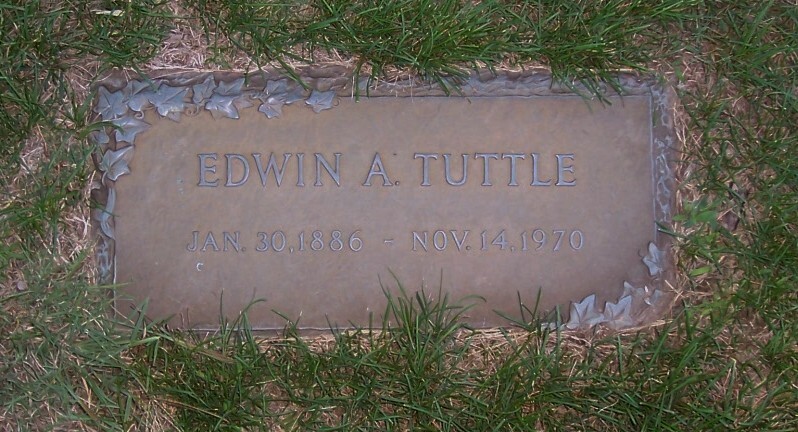 [S3981] Find A Grave: Forest Lawn Memorial Park, Omaha, Nebraska, Edwin Augustus Tuttle, created by Sue and Marvin & Samme Templin, date Jul 2011, memorial number 73056817. Leavenworth Native a Carpenter and Contractor--Funeral Wednesday. Raymond A. Tuttle, 54, 709 Oak Street, a carpenter and contractor herefor many years and a native of Leavenworth, died at noon today (Sept.27, 1943) at St. John's hospital. He had been ill for several monthsand was taken to the hospital Saturday. 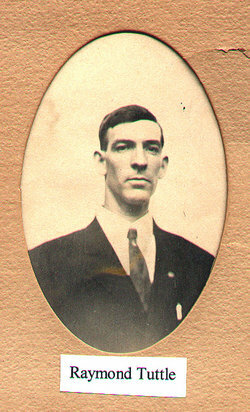 Mr. Tuttle was born in Leavenworth June 14, 1890, a son of Frederickand Mary Tuttle, early residents of the city. He was a member of theCarpenters' Union and of the Fraternal Order of Eagles. He is survived by his widow, Mrs. Clara A. Tuttle of the home; twodaughters, Mrs. Dorothy Linaweaver, Lansing; Mrs Leona Reed, of thehome; one son, Raymond A. Tuttle, Jr., city; two sisters Mrs. OliveGorzkiewicz and Mrs. Alberta Spindler both of 765 Olive street; twobrothers, Edward Tuttle, Omaha, Neb; Russell Tuttle, 914 Osage street;and five grandchildren. Funeral services will be held Wednesday afternoon at 2 o'clock at theSexton funeral chapel. The Rev. Franklyn R. Beery will officate.Interment will be in Mount Muncie cemetery. The Body will remain atthe chapel until the hour of service. 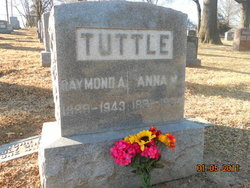 [S3959] Find A Grave: Mount Muncie Cemetery, Lansing, Kansas, Raymond Andrew Tuttle, created by tribe hunter & sue rush, added Mar 2010, memorial number 49909815. [S3964] Find A Grave: Oakmont Memorial Park, Lafayette, California, Margaret Leona Tuttle Etherton, created by Sue Rush, added Jun 2012, memorial number 92174012. [S3977] Find A Grave: Sunset Memory Gardens, Leavenworth, Kansas, Alberta Winnick Tuttle Spindler, created by tribe hunter, added Jul 2009, memorial number 39460210. To view the notice, please click here. Funeral services for Russell A. Tuttle, 86, 920 S. Fifth, will be at 2p.m. Wednesday at the Belden-Sexton-Sumpter Funeral Chapel. Burialwill be in Sunset Memory Gardens. He died Monday at the Leavenworth County Infirmary. Mr. Tuttle was born Oct. 20, 1894, in Leavenworth to Frederick andMary Robbins Tuttle. He was married to Josephine Schmidt for 62 years. He was a painter employed by the Smith Brothers Painting Company.After he retired from that position he was employed by the SnyderGrocery Co.
Mr. Tuttle was a member of the First Christian Church, Hiram MasonicLodge No. 68, A.F. & A.M. and Abdallah Shrine. His survivors include his wife Josephine Tuttle of the home; onesister, Mrs Alberta Spindler, 1135 Ironmoulders, and several niecesand nephews. Friends may call at the Belden-Sexton-Sumpter Funeral Chapel. Thefamily suggests memorials to the church or to the Leavenworth CountyInfirmary. [S3970] 1940 US Federal Census, Leavenworth, Leavenworth County, Kansas, digital image Ancestry.com ; National Archives micropublication, Russell A Tuttle head of household, roll T627_1240, enumeration district 52-25A, page 8B. [S2704] Wayne Howland, family tree titled "Howland Gravel Jones Wade of New England", published by Ancestry.com, wc.rootsweb.ancestry.com, from database named wayne_howland, updated Jul 2010, viewed Nov 2012. [S3797] Find A Grave: Evergreen Cemetery, Pittsford, Vermont, Burt William Howland Sr, created by Janet Muffx, added Feb 2012, memorial number 85129349. [S147] 1900 US Federal Census, Brandon, Rutland County, Vermont, digital image Ancestry.com ; National Archives micropublication, Burt W Howland head of household, roll T623_1693, enumeration district 0179, page 8A. [S32] 1910 US Federal Census, Brandon, Rutland County, Vermont, digital image Ancestry.com ; National Archives micropublication, Bent H Howland head of household, roll T624_1616, enumeration district 0175, page 4A. [S2704] Wayne Howland, family tree titled "Howland Gravel Jones Wade of New England", published by Ancestry.com, wc.rootsweb.ancestry.com, from database named wayne_howland, updated Jul 2010, viewed Feb 2015. [S5660] Find A Grave: Green Bower Cemetery, Gardner, Massachusetts, Alice Analiza Howland Giddings, created by Ed Poulin, added Sep 2013, memorial number 117355998. [S5660] Find A Grave: Green Bower Cemetery, Gardner, Massachusetts, Phyllis A Giddings Hill, created by Ed Poulin, added Sep 2013, memorial number 117356076. [S3895] 1910 US Federal Census, Buffalo, Wheeler County, Nebraska, digital image Ancestry.com ; National Archives micropublication, Wilmer A Reeves head of household, roll T624_856, enumeration district 0243, page 2B. [S3896] Find A Grave: Main Cemetery, Belgrade, Nebraska, Wilmer Albin Reeves, created by Don, added Mar 2004, memorial number 10664871. [S3896] Find A Grave: Main Cemetery, Belgrade, Nebraska, Anna Catherine Springer Reeves, created by Don, added Mar 2005, memorial number 10664885. [S3900] 1920 US Federal Census, Gritta Ridge, Wheeler County, Nebraska, digital image Ancestry.com ; National Archives micropublication, Wilmer A Reeves head of household, roll T625_1003, enumeration district 265, page 5B. [S1853] South Dakota Births, 1856-1903, online database, digitized by Ancestry.com Operations Inc, 2003 www.ancestry.com. Original publication: South Dakota Department of Health South Dakota Birth Records with Birth Dates over 100 Years, South Dakota Department of Health. [S3896] Find A Grave: Main Cemetery, Belgrade, Nebraska, Emma R Reeves Foland, created by Don, added Mar 2012, memorial numbe 86287787. [S3915] 1940 US Federal Census, Other Places, Shasta County, California, digital image Ancestry.com ; National Archives micropublication, Earl C Reeves head of household, roll T627_344, enumeration district 45-14, page 15B. [S816] California Death Index, 1940-1997, online index database, digitized by Ancestry.com Operations Inc, 2000 www.ancestry.com. (Original publication: State of California California Death Index, 1940-1997, State of California Department of Health Services). 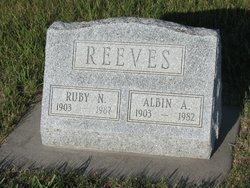 [S3896] Find A Grave: Main Cemetery, Belgrade, Nebraska, Alvin Albert Reeves, created by Don, added Jun 2004, memorial number 8968175. [S3905] 1930 US Federal Census, Hettinger, Adams County, North Dakota, digital image Ancestry.com ; National Archives micropublication, Henry Fossens head of household, roll 1731, enumeration district 14, page 11B. [S3896] Find A Grave: Main Cemetery, Belgrade, Nebraska, Ruby Augustus Nichols Reeves, created by Don, added Jun 2004, memorial number 8968163. 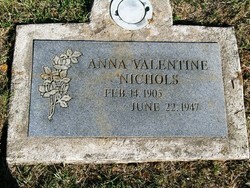 [S3901] Find A Grave: Fern Prairie Cemetery, Camas, Washington, Anna Valentine Reeves Nichols, created by Don, added Jun 2004, memorial number 8968306. [S3901] Find A Grave: Fern Prairie Cemetery, Camas, Washington, Perry Marion 'Peg' Nichols, created by Don, added Jun 2004, memorial number 8968291. [S3906] 1940 US Federal Census, Belgrade, Nance County, Nebraska, digital image Ancestry.com ; National Archives micropublication, Perry M Nichols head of household, roll T627_2258, enumeration district 63-13, page 5B. [S3907] Washington Marriage Records 1854-2013, online image database transcription, digitized by Ancestry.com Operations Inc, 2012 www.ancestry.com . (Original publication: Vital Records Office Washington State Archives, Olympia, Washington: Washington State Archives.). [S3896] Find A Grave: Main Cemetery, Belgrade, Nebraska, Maybelle Reeves McKenzie, created by Don, added Jun 2005, memorial number 11138552. [S3896] Find A Grave: Main Cemetery, Belgrade, Nebraska, Leo McKenzie, created by Don, added Jun 2005, memorial number 11138561. [S3896] Find A Grave: Main Cemetery, Belgrade, Nebraska, Clark Hazelton Nichols, created by Don, added Jun 2004, memorial number 8964135. [S3896] Find A Grave: Main Cemetery, Belgrade, Nebraska, Mary Alice Applegit Nichols, created by Don, added Jun 2004, memorial number 8964150.